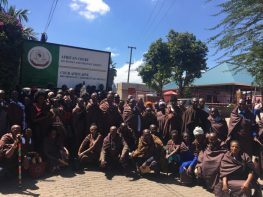 Minority Rights Group International (MRG) wholeheartedly applauds an historic judgment from the African Court of Human and Peoples Rights in Arusha today in favour of the Ogiek community of Kenya. Following an eight-year legal battle, the Court found that the Kenyan government violated seven separate articles of the African Charter in a land rights case that dates back to colonial times. ‘Crucially the Court has recognised that the Ogiek – and therefore many other indigenous peoples in Africa – have a leading role to play as guardians of local ecosystems, and in conserving and protecting land and natural resources, including the Mau Forest,’ says Lucy Claridge, MRG’s Legal Director, who argued the case before the Court. ‘For the Ogiek, this is history in the making. The issue of Ogiek land rights has finally been heard and the case has empowered them to feel relevant. I know that the case also gives hope to other indigenous peoples: it has made the issues seem real,’ says Daniel Kobei, Executive Director of Ogiek Peoples’ Development Program (OPDP). The Ogiek, 35, 000 of whom are the victims in this landmark case, live in the Mau Forest Complex in the Rift Valley of Kenya. They are one of the last remaining forest-dwelling communities and among the most marginalised indigenous peoples in Kenya. They alleged eight violations of their rights to life, property, natural resources, development, religion and culture by the Kenyan government under the African Charter, to which Kenya is a signatory. This is the first time the African Court, in operation since 2006, has ruled on an indigenous peoples’ rights case and is by far the largest ever case brought before the Court. It was originally lodged with the African Commission on Human and Peoples’ Rights, but was referred for the first time in history to the Court on the basis that it evinces serious and mass human rights violations. Minority Rights Group International, Ogiek Peoples’ Development Program and CEMIRIDE were the three original Complainants before the African Commission. ‘By ruling that through a persistent denial of Ogiek land rights, their religious and associated cultural and hunter-gatherer practices were also violated, the Court has sent a crystal clear message to the Kenyan and other African governments that they must respect indigenous peoples’ land rights in order to secure their livelihoods and cultures,’ adds Lucy Claridge. For decades, Ogiek have been routinely subjected to arbitrary forced evictions by the government from their ancestral land in the Mau Forest, without consultation or compensation. This has had a detrimental impact on the pursuit of their traditional lifestyle, religious and cultural life, access to natural resources and their very existence as an indigenous people. Ogiek have a spiritual, emotional and economic attachment to the forest. They rely on it for food, shelter and identity. Given that Ogiek rights over ancestral land are already recognised in both the Kenyan Constitution and recently enacted Community Land Law, and in light of the upcoming elections and history of lax implementation of the African Commission Endorois judgment, MRG now urges the Kenyan government to fully respect the Court’s judgment and take immediate steps to remedy the violations experienced by Ogiek over decades. Earlier this month a UN anti-racism body also urged the Kenyan government to ensure legal acknowledgement of the collective rights of indigenous peoples, and prevent, punish and sanction acts threatening their security and property.